Today (August 16, 2012—I know, a day late with the wallpaper) Endeavour and Atlantis are switching places. By the time you read this, Endeavour will have backed out of Orbiter Processing Facility (OPF) 2, Atlantis will have rolled out of the VAB, and the press will have taken tons of photos of the two spacecraft as they came nose-to-nose for one last time (check out Kennedy Space Center’s twitter feed for some sweet images of the moment). Endeavour will now move into the VAB and remain there until its September flight to Los Angeles. Atlantis will be in OPF-2 until it moves to the Kennedy Space Center Visitor Complex in November. I hope to see you all at the grand opening of the KSCVC Atlantis exhibition in July 2013. 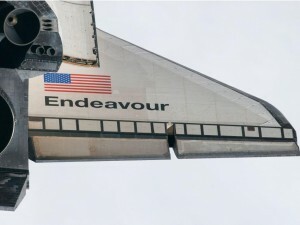 Click on Endeavour’s starboard wing to download wallpaper.